Over 340 activists of Cauvery Protection Movement were arrested by police in Karur district in central Tamil Nadu on October 12 while protesting against illegal sand mining on the Cauvery river bed. The river has been in news in the past few months owing to the dispute over water sharing that sparked off due to deficient rain in basin areas. According to the members of the movement, illegal sand mining was going uncurbed along the 3-km stretch on the river bed from Kadambakurichi to Thavittupalayam in Karur district. They handed over video evidence of unscrupulous sand mining to the district administration and demanded closure of sand mines on the river bed. Their demand echoes the Madras High Court’s order in 2010 that banned sand quarrying from the Tamirabarani for five years. In 2015, the court had questioned why sand quarrying should not be banned from the Cauvery riverbed too. In 2014, Down To Earth had reported how Tamil Nadu government failed to ensure that sand mining is scientific and sustainable. The CPI leader R Nallakannu, who also participated at the protest march, alleged that about 15 earthmovers were being used in a quarry against the permissible limit of two machines. This, he claimed, had affected the groundwater table in the region. In June 2015, the Kerala government imposed a total ban on sand mining from six rivers. The opportunity to sell sand to Kerala for very high prices was lapped up by mining mafia. As the sand mined from Cauvery is transported to Kerala, it leads to a drop in water levels in the Harangi and Lakshmana Tirtha rivers during the dry season. In July 2016, the members of the Movement Against Devastation demanded that the Centre and the Tamil Nadu government declare the entire Cauvery delta as a protected agricultural zone. It will lead to a ban on all types of industrial activities in the region. Their demand gains relevance, especially when about 90 per cent of surface water in Tamil Nadu had been exploited, according to B J Pandian, Director of Water Technology Centre at Agriculture College and Research Institute (ACRI), Madurai. 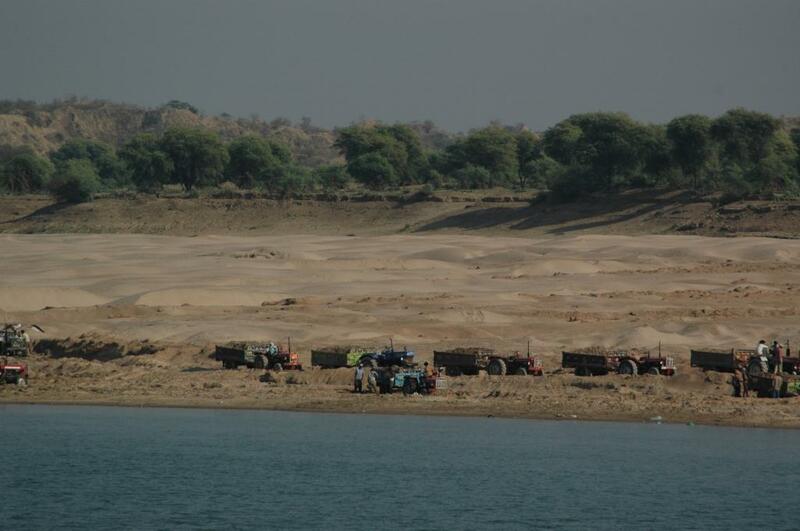 While conservationists have been blaming changed rainfall patterns for the reduced volume of water in the Cauvery River, encroachment of the riverbed to meet the rising demand for sand is often overlooked as a major reason for reduced flow of water. Even in Kodagu district, from where the river originates, depleting water table led to water shortage in December 2015. Indiscriminate mining of sand from in-stream and floodplain areas has led to severe damages to the river basin environment. According to Gopakumar M, who studies otters in the Cauvery, sand not only recharges the ground water table but also “slows down the flow of water and allows water percolation across large areas on either side of the river”. When sand and gravel are extracted at a rate far exceeding the capacity of rivers to replenish them, the entire ecosystem is affected. The removal of sand from the river bed increases the velocity of the flowing water. Moreover, since sand acts like a sponge helping in recharging the water table, its depletion in the river results in declining water tables, threatening water security. An expert committee, headed by the Central Water Commission chairman G S Jha, is expected to submit its report on October 17 to the three-judge bench of the Supreme Court, outlining water conservation methods for the Cauvery River. Apart from pollution and deforestation, the committee needs to look into sand mining and how much of it can be sustainably extracted. Tamil Nadu, the only state in India where the government undertakes sand mining, had banned sand mining by private contractors in 2003 and handed over the responsibility to the Public Works Department (PWD).